I rolled into Breaux Bridge, Louisiana during a rainstorm, with raindrops the size of gum balls falling so fast on my windshield that I can hardly see the car in front of me. It is over almost as quickly as it started. I have been told this is a typical mid-day shower in Cajun Country, daily "mini showers" roll in from the Gulf and last just a few minutes, but really drench the earth. The landscape is bright green, and lush thanks to these showers. I arrive at my hotel to be greeted by a lovely wreath on the door. At first it appears they forgot to take down their Christmas decorations, but upon closer inspection I see they are covered in red Crawfish, and netting material in honor of the Crawfish Festival that happens in this town. I can't help but smile. It's the little things that make small towns so special. I have driven 1200 miles with a fellow survivor, April, to support a cause near and dear to me: Traumatic Brain Injury. Paul Bosworth, my friend and a survivor, started BBQ4TBI several years ago in an effort to raise money and awareness for brain injury. The BBQ has taken on a life of it's own, and in it's third year has over 30 teams ready to take part in this state sanctioned BBQ cook-off. Proceeds are to benefit the Brain Injury Alliance of Louisiana and help bring awareness to TBI. 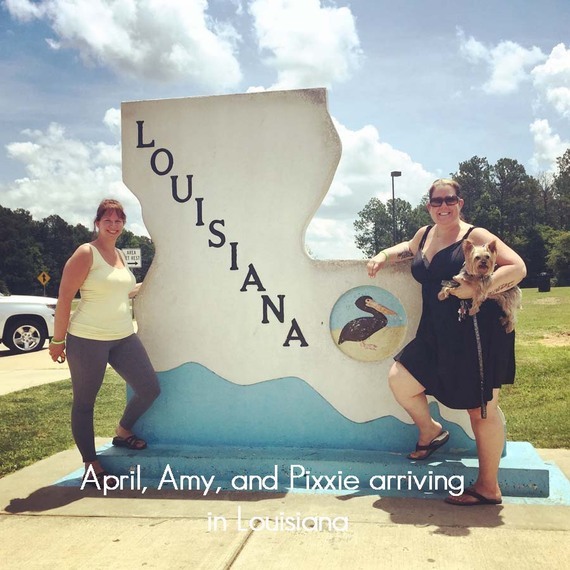 Myself, April, and Pixxie loaded up the car and road tripped to Louisiana to support the cause, as well as sell my art and "awareness bracelets" at the BBQ. I am honored to have been a part of something so amazing. I had no idea how serious of a "sport" that BBQ is in the south. These folks take their BBQ very seriously, and their reputation is on the line. 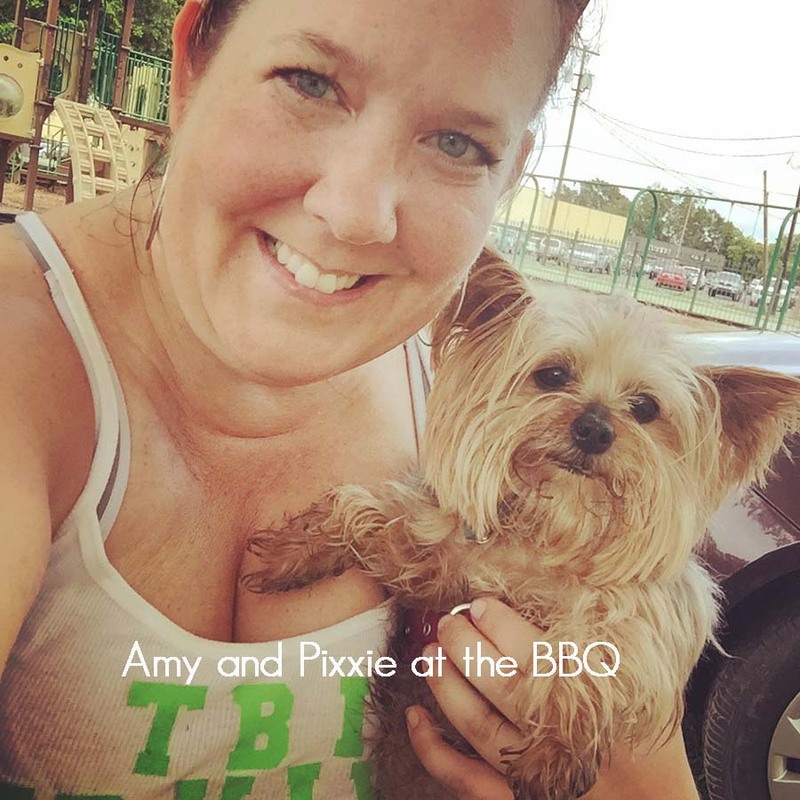 In addition to BBQ, we helped bring awareness to many about TBI, which is the leading cause of death in Americans under 45 years old. 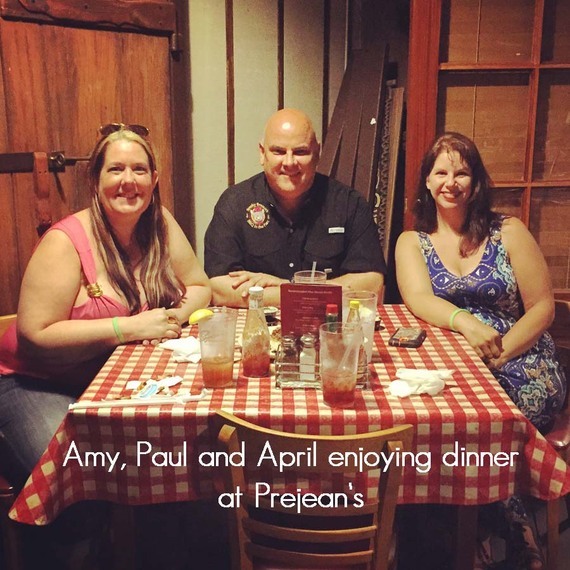 Upon our arrival into town, Paul graciously took us out to dinner at Prejeans for some authentic local cuisine. We had gator bites, boudin, shrimp fondeaux, effete, and so much more! For dessert we had sweet potato pecan pie, and it was simply amazing! Pecan pie is one of my all time favorites, and this took the cake (pun intended)! The fine folks at the St. Martin Parish Tourist Commission generously put us up at the Microtel Inn of Beaux Bridge. We had a very enjoyable stay, and the staff was outstanding ~ southern hospitality at it's best! We enjoyed breakfast at Cajun Donuts, I had a ham and cheese kolache and a chocolate donut! I have to say, it was one of the best donuts ever, so soft and fresh, and still warm from the oven! We stopped at a local antique store, Le Papillon, where April found a glass swan and I found a fun new sparkly ring. When we first pulled up, they had just flipped around the "closed" sign. However, when they saw us they graciously allowed us to come on in and shop, stating they were in no hurry. I love Southerners attitudes! We had a free day before the big event and took the opportunity to drive through the gorgeous Lake Martin area. We had a picnic lunch on the shore with a light breeze blowing in off the water. April saw a raccoon watching us eat, and I witnessed a stray cat eying us up. We took a leisurely drive through the small towns, including St. Martinville, where we toured the Longfellow-Evangaline State Site. The BBQ started with us putting up our tent in a rain and wind storm. We almost lost the tent once to the wind, but we managed to get it up and get everything set up without getting soaked. As soon as we were set up, the skies parted and we had a beautiful, albeit steamy, afternoon. We had a few sales and met some really great people. Most importantly, we helped support a really great cause and raise awareness for TBI. 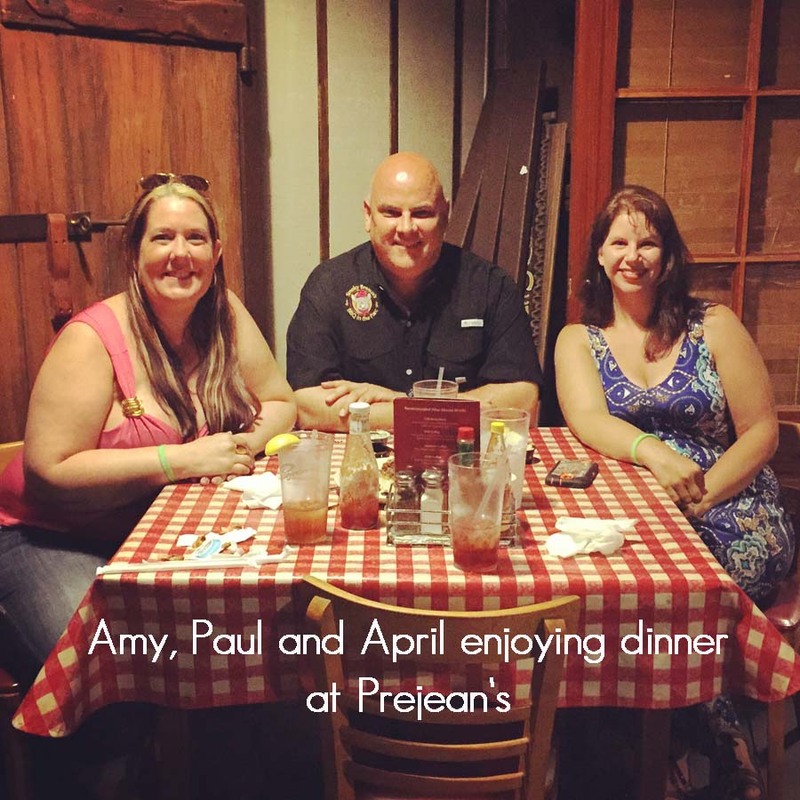 After the BBQ we drove to Henderson for dinner at Pat's Fishermans Warf and enjoyed a Creole shrimp dinner and crabcakes. The crab cakes were absolutely amazing, hands down some of the best I have ever had anywhere! They were stuffed full with crab and buttery deliciousness that literally melted in your mouth! The following day we drove to Avery Island where we toured the Tabasco plant and sampled some of their delicious sauces. Afterwards we drove through Jungle Island where we saw quite a few alligators, a whole "bird city" of snowy white Egrets, a buddha statue, and lots of lush, green trees. We were fascinated by the Live Oak trees with the ferns and moss growing on them. These trees can live to be hundreds of years old. After our tour we drove to Cypremort Point and enjoyed some leisurely time on the beach before heading back to the hotel just beating the rain storm. We finished out our stay in Beaux Bridge with dinner at the Waffle House, which was the perfect ending to a perfect trip! Paul has done something spectacular for Brain Injury Awareness and I am so proud of him and all of his efforts. I know what kind of energy it takes to put on an event like this, and I also know what kind of toll it takes on a brain injury. I hope that he is able to rest and recover for a few days before he begins planning next year's event! A want to extend a heartfelt "thank you" to Paul, and all of the hospitable folks of Beaux Bridge! I thoroughly enjoyed my stay, and can't wait to return again soon!